The Universal Orlando Resort, commonly known as Universal Orlando, formerly Universal Studios Escape, is an American theme park and entertainment resort complex based in Orlando, Florida. The resort is operated by Universal Parks & Resorts. It is wholly owned by NBCUniversal, a division of Comcast. Universal Orlando is the second-largest resort in Greater Orlando, after the Walt Disney World resort, covering 541 acres of land. Universal Orlando consists of two theme parks (Universal Studios Florida and Universal's Islands of Adventure), a water park (Volcano Bay), a night-time entertainment complex (Universal CityWalk Orlando), and six Loews Hotels (Loews Portofino Bay Hotel, Hard Rock Hotel, Loews Royal Pacific Resort, Cabana Bay Beach Resort, Loews Sapphire Falls Resort, and Universal’s Aventura Hotel). All of the hotel resorts offer Early Park Admission into The Wizarding World of Harry Potter and Universal’s Volcano Bay. Additionally, the Loews Portofino Bay Hotel, Hard Rock Hotel and Loews Royal Pacific Resort offer free unlimited Universal Express Pass for use at participating rides at Universal Studios Florida and Universal’s Islands of Adventure. This benefit is not valid at Volcano Bay, Halloween Horror Nights or Rock the Universe. Universal Orlando is one of the most visited resorts in the world, currently with an annual attendance of 21 million in 2017. Universal Orlando is the flagship resort of Universal Parks & Resorts, especially due to the competitive nature between the resort and Walt Disney World. Universal Orlando opened on June 7, 1990 as the theme park Universal Studios Florida. It was opened as a joint venture between Universal Entertainment and The Blackstone Group. The park was in direct competition with Disney MGM Studios (now called Disney's Hollywood Studios). In 1994, executives started planning the expansion of the resort into a multi-day vacation destination. In late 1995, construction began on a new park, Islands of Adventure. The Islands of Adventure Preview Center opened in May 1997 replacing the Screen Test Home Video Adventure. During this time, several new attractions were being built and opened at Universal Studios Florida, including Woody Woodpecker's KidZone, which opened in 1998, Men in Black: Alien Attack and Animal Actors On Location! (formerly Animal Planet Live). On May 28, 1999, Universal’s Islands of Adventure opened to the general public. It featured six themed "islands", including the Port of Entry, Seuss Landing, The Lost Continent, Jurassic Park, Toon Lagoon, and Marvel Super Hero Island. The park opened to mediocre attendance, and several attractions were closed shortly thereafter, including Island Skipper Tours, due to lack of attendance. Along with the new theme park, the resort also opened a Florida version of Universal CityWalk from Universal Studios Hollywood. CityWalk Orlando, but with different venues and design. Universal also opened the resort's first onsite hotel in September 1999. Loews Portofino Bay Hotel (originally Portofino Bay Hotel, a Loews Hotel) was operated and partially owned by Loews Hotels but was also partially owned by Universal and The Blackstone Group. 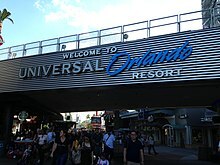 The two theme parks, CityWalk, and the hotel were branded as Universal Studios Escape, however the name was quickly changed to Universal Orlando Resort. In December 2000, Hard Rock Hotel opened as Universal Orlando's second onsite hotel. Despite its name, the hotel is owned by Loews Hotels, like Loews Portofino Bay Hotel and is not affiliated with Hard Rock International. In 2001, Loews Royal Pacific Resort opened. In the midst of all these openings, two parking garages were constructed and the popular water park Wet 'n Wild Orlando was acquired. In 2003, rumors began swirling that a Harry Potter themed attraction would be coming to Universal or one of the Disney parks. On May 31, 2007, Universal, in partnership with Warner Bros., officially announced The Wizarding World of Harry Potter would be added to its Islands of Adventure park. Just over three years later, on June 18, 2010, the seventh "island" at Universal's Islands of Adventure, The Wizarding World of Harry Potter, opened. Shortly after the massive success of the grand opening of The Wizarding World of Harry Potter - Hogsmeade, rumors began to swirl once again, this time of a second Potter-themed area in Universal Studios Florida. It was announced shortly thereafter that Universal would begin construction of The Wizarding World of Harry Potter -Diagon Alley, replacing Jaws: The Ride. On July 8, 2014, Diagon Alley officially opened to the public. The Blackstone Group sold its stake in Universal Orlando in early 2011. The original theme park in the resort, Universal Studios Florida, opened on June 7, 1990, as a theme park that let visitors "Ride the Movies." The park is composed of themed areas and attractions based on the film industry. Visitors get themed dining and shopping, a variety of special events throughout the year, and may even catch an actual film crew at work on the backlot. The themes of Universal Studios Florida are targeted at making guests feel like they are on a movie set with rides, shows, and attractions inspired by popular film, television, and music productions. The park consists of eight themed areas – Hollywood, Production Central, New York, San Francisco, Diagon Alley/London, World Expo, Springfield, and Woody Woodpecker's Kidzone. 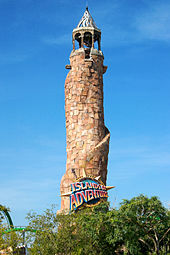 The second park to open at the resort was Universal's Islands of Adventure, opened on May 28, 1999. It is composed of seven distinct "islands" that are themed to various forms of adventures. Visitors start off in the Port of Entry and make their way through the various islands – Marvel Super Hero Island, Toon Lagoon, Jurassic Park, The Wizarding World of Harry Potter - Hogsmeade, The Lost Continent, and Seuss Landing. The Wizarding World of Harry Potter, based on the popular Harry Potter franchise, is the only island added after the park opened; it opened to the public on June 18, 2010. Universal CityWalk opened on May 28, 1999 over the former parking lot and entrance as part of the expansion that created the Universal Orlando Resort. Guests arrive at the resort park in one of two multi-story parking structures, then travel via covered moving sidewalks over Universal Boulevard into CityWalk. From there, guests can proceed into either of the theme parks, Universal Studios Florida or Islands of Adventure. The Universal Store offers merchandise from both parks. CityWalk features shopping, nightclubs, dining venues, an AMC Movie Theater, and a Blue Man Group show. There are many night clubs at CityWalk including Groove, CityWalks's Rising Star (a karaoke club with a live band), Red Coconut Club, and Bob Marley-A Tribute to Freedom (both a night club and restaurant). Some notable locations are The Cowfish, Hard Rock Cafe, Jimmy Buffett's Margaritaville, Emeril's, Bubba Gump Shrimp Company and Voodoo Doughnut. Casual dining locations include: Moe's Southwest Grill, Burger King Whopper Bar, Panda Express, Red Oven Pizza Bakery, and Fusion Bistro Sushi & Sake Bar. Volcano Bay is a 27 acre water-theme park that opened in 2016. It replaced Wet 'n Wild, owned by Universal, as the resort's water park. Wet 'n Wild was founded in 1977 by SeaWorld founder George Millay as one of the first major water parks. In 1998, Wet 'n Wild was acquired by Universal Parks & Resorts, adding it to Universal Orlando. There were eighteen water slides and attractions at the water park. Popular attractions included The Storm, Bomb Bay, Disco H20, Mach 5, and The Surge. Wet 'n Wild was located at the intersection of International Drive and Universal Boulevard, about half a mile south of the Universal Orlando parking garage. Wet 'n Wild officially closed on December 31, 2016 due to the opening of Volcano Bay. It was announced on March 21, 2017 that the land once occupied by Wet 'n Wild would be transformed into Universal's seventh hotel. It was later learned that Universal would split the property into two hotels, rather than one resort. At a Q&A session in mid-2018, Universal executives confirmed that they were looking at building a fourth theme park in the future, citing the trademark "Fantastic Worlds" as a possible name for that park. Construction began in 2018 on the 540 acre plot of Universal-owned land south of the current resort, and is speculated to be the location of the new park. The resort features six official on-site hotels totaling up to 6,200 rooms. All six hotels are located in close proximity to the Universal Orlando theme parks. The hotels offer guests free water taxi or shuttle bus service to the Universal Orlando theme parks. The hotels are sorted into three categories; premier hotels, preferred hotels and prime value hotels. Two more resorts will be built on the land previously occupied by Wet 'n Wild Orlando and are expected to be open by mid-2019. The hotels, which will have a total of 2,800 rooms on 64 acres of former Wet 'n Wild land, will be split by Universal Boulevard with one 2,050-room resort on one side and another 750-room resort across the way. The hotels will begin taking reservation in early 2018. On April 5, 2018, the name of these hotels were announced as Surfside Inn and Suites, which will open in 2019, and Dockside Inn and Suites, which will open in 2020. The hotels' new area will be called Universal’s Endless Summer Resort. On select nights in September through early November, Universal Studios Florida is transformed into the annual Halloween event, Halloween Horror Nights. Halloween Horror Nights, or HHN as it is more commonly known, is one of the largest Halloween events in the U.S. From 1991–2001, the event was held at Universal Studios Florida. Halloween Horror Nights was moved to Islands of Adventure in 2002, and the 2004 event featured sections of both parks, but the event was moved back to Universal Studios Florida in 2006. The event celebrated its twentieth anniversary in 2010, and celebrated its 25th anniversary in 2015. The event typically features an "icon" that presides over the terror each evening along with an average of nine haunted houses and numerous unavoidable scare zones. It is a separately ticketed event. Rock the Universe is an annual Christian rock music festival that is located within Universal Studios Florida. It began in 1998, and has been running ever since. The event typically occurs in early September, and lasts for two days. In 2019, Rock the Universe will take place in early February for the first time ever. Many Christian rock artists play throughout the event both nights. The resort offers special tickets, packages, and church partnerships for that weekend. Select attractions are also opened throughout the evenings. Summer Concert Series occurs annually, on select Saturday nights, and features a variety of popular music acts performing live at The Universal Music Plaza Stage in the Production Central section of Universal Studios Florida; adjacent to the Hollywood Rip Ride Rockit roller coaster. This event is included with a regular park admission, and occurs during normal park operating hours. Grad Bash and Gradventure are two separate events held in April and May at the parks. Grad Bash is an event for graduating high school senior classes who can gather for an exclusive, all-night party at Universal Orlando and Islands of Adventure. This event features live performances by some of the most popular artists, dance parties with DJs, and pre-parties at The Universal Music Plaza Stage in the Production Central section of Universal Studios Florida. Gradventure is very similar but is designed for graduating middle school students. Both events are sponsored by Coca-Cola. Macy's Holiday Parade brings some authentic balloons from the Macy's Thanksgiving Day Parade to Orlando in a month-long event in December that highlights the Christmas celebrations within Universal Studios Florida. Generally in February through to April, a parade and concert series inspired by New Orleans' Fat Tuesday party is held within Universal Studios Florida. The event features merchandise especially for the celebration and is held usually on Friday and Saturday nights. Every event night guests will hear some of Louisiana's bands performing blues, and Zydeco. An after party occurs in the French Quarter at Universal CityWalk. It is included with park admission. A Celebration of Harry Potter is an annual three-day weekend event held on the last weekend of January at both Universal Studios Florida and Islands of Adventure, celebrating the fandom of the Harry Potter books authored by J. K. Rowling, the Wizarding World franchise (including the Harry Potter film series and Fantastic Beats film series), in a collaboration between Universal Parks & Resorts, Warner Bros. Entertainment and Scholastic. The event, introduced on the weekend of January 24–26, 2014, features film talent Q&A sessions, panels, special demonstrations, photo-ops, exhibitions from Pottermore, Scholastic, graphic designer company MinaLima and film props and costumes brought in from the Warner Bros. Studio Tour London in Leavesden and the touring Harry Potter exhibition. During the event's debut in 2014, the Diagon Alley expansion of The Wizarding World of Harry Potter at Universal Studios Florida was still under construction at the time, raising an expectation among the celebration's attendees at what to expect of the new area of the theme park, which was set to open that same year. In September 2018, Universal announced the 2019 edition of the event would not be celebrated, in order to focus on the construction of Hagrid's Magical Creatures Motorbike Adventure, set to open on June 13, 2019, which will replace the Dragon Challenge. Many attractions in Universal Studios Florida and Islands of Adventure allow guests to utilize Express Pass. This pass admits guests to a separate line for the attraction, which is given priority status when boarding. Express Pass is not a virtual queuing service. Instead, passholders may enter the "Universal Express" line whenever they wish. This pass is not included with park admission. Guests can choose to purchase one of two options: Express Pass, which gives guests access to the express line one time per participating attraction per day or Express Unlimited™ Pass, which allows guests to skip the regular lines an unlimited number of times at participating attractions per day. The Universal Meal Deal was a ticketed Meal Plan for park visitors. It allowed visitors of either theme park to eat all day long from lunch through dinner at select restaurants. These included Mel's Drive-In and Louie's Italian Restaurant at Universal Studios Florida and Circus McGurkus Cafe Stoo-pendous, Comic Strip Cafe, and The Burger Digs at Universal's Islands of Adventure. The selection food is limited, and drinks are not included. Beverages can be purchased through a Universal Souvenir Cup. For additional costs, visitors may add park-to-park Meal Deal Access allowing them to eat meals in both parks. Universal Meal Deal was replaced on November 3, 2013 with Universal Dining Plan - Quick Service. Walkway entrance to the Theatre from CityWalk, shown prior to the construction of the Hollywood Rip Ride Rockit roller coaster. 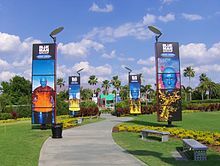 On November 9, 2006, Universal Orlando announced that the Blue Man Group would be coming to the resort in a new theatre, which in May 2007 was named the Sharp Aquos Theatre. Construction of the theatre began shortly after the announcement. The theatre is contained within Sound Stage 18, which was occupied by Nickelodeon Studios from 1990–2005. The sound stage was home to shows such as Slime Time Live, Legends of the Hidden Temple, Figure It Out, and Double Dare 2000. In 2005, the sound stage was used for Where Evil Hides, a haunted house for Universal's Halloween Horror Nights: Tales of Terror event. The theatre is located between the Hard Rock Cafe and the main entrance to Universal Studios Florida. The 1,000-seat theatre features a 30-foot-tall (9.1 m) Blue Man facade, and is accessible both from the Universal CityWalk as well as the Universal Studios theme park. In preparation for the rezoning of the building into CityWalk, a walkway was constructed between the Universal Studios theme park and the resort's Hard Rock Cafe allowing guests to enter the theatre without paying admission to the theme park, while the former Nickelodeon Studios entrance at the theme park was turned into an attended exit from the theme park to the theatre's entrance. The theatre's seating diagram is organized into five different "zones". The "Poncho" zone consists of the first four rows of the theatre. It bears this name because of the ponchos that are in each seat of the zone as guests take their seats. This is due to the possibility of materials leaving the stage. The other zones, Zones 1–4, are arranged to provide the best possible view of the show no matter where you sit. The theatre has 13 ADA seats throughout to comply with the Americans with Disabilities Act of 1990. Assistance for the hearing and vision impaired is also available. As of October–November 2008, the pathway to Sharp Aquos Theatre has been moved for construction of Hollywood Rip Ride Rockit, a roller coaster which opened in mid-2009. Construction on the coaster also resulted in the replacement of The Boneyard by The Universal Music Plaza Stage and the entrance of Rockit, and the reconfiguration of the queue of Twister...Ride it Out. Universal Orlando features a large group of characters varying from Woody Woodpecker to Spider-Man. Visitors have three ways of dining with characters. At Loews Royal Pacific Resort, guests can eat breakfast with Universal Characters on select days also. Throughout the day characters have meet and greets within the parks and make appearances during lunchtime at several theme park restaurants. During dinner, on select nights, guests can have dinner with Universal Characters at Trattoria del Porto, The Kitchen, and Islands Dining Room. The Marvel Super Heroes also appear in the Meet the Marvel Super Heroes attraction where the characters ride on motorcycles down the street of Marvel Super Hero Island. Throughout Universal Orlando and its vicinity there is an organized transportation system which transports guests between the onsite hotels, Universal Partner Hotels, the theme parks, and other area attractions. Mears Transportation runs the system. Orlando's LYNX bus system connects the resort to other places in the city. Universal Orlando's internal transportation system is often dubbed Universal Transit. The system consists of water taxis, buses, escalators, elevators, moving walkways, and pathways which transport guests between the parking structure, hotels, CityWalk, and the theme parks. Onsite hotel guests can get to the theme parks and CityWalk by either boarding a water taxi which will take them directly to CityWalk or may use walkways. The dock at CityWalk is located at the center of CityWalk and can be accessed by theme park visitors via the bridges connecting CityWalk to the theme parks. Along the pathways, bicycles also transport guests for an additional cost. For guests who prefer not to use a water taxi or walk, they will find shuttle transportation also available at the onsite hotels. These stop at five locations: Loews Portofino Bay Hotel & Spa, Hard Rock Hotel, Loews Royal Pacific Resort, Sapphire Falls Resort and Universal Orlando theme parks. Cabana Bay Beach Resort has dedicated shuttles to the parks. The resort also features two large parking structures, for day and night guests who need to park, connected by bridge to Citywalk and the theme parks. The vicinity of Universal Orlando consists of several hotels and a major airport all located within 20 minutes of the resort. Universal's Super Star Shuttle service is broken into two main routes. One provides transportation to all thirty Universal Partner hotels while the newest route began service to Orlando International Airport in 2016. Universal's Super Star Shuttle provides free transportation between Universal Orlando, SeaWorld and Aquatica. Airport service is available for a fee to onsite hotel guests booking through Universal Parks & Resorts Vacations. The new airport route is expected to initially only be offered for onsite hotel guests. The airport shuttle is run through Super Shuttle Transportation. The Seaworld/Aquatica shuttle is run by ESCOT. The original entrance to Universal Studios Florida. The entrance to Universal Studios Florida in 2007. ^ "Bill Davis, President & COO, Universal Orlando". Press Releases. Universal Orlando. Archived from the original on February 8, 2013. Retrieved December 6, 2012. ^ Storey, Ken. "Universal gets its way and acquires more land near I-Drive for future theme parks". Orlando Weekly. Retrieved May 30, 2018. ^ Hill, Jim (May 8, 2013). "Exclusive: A Detailed Look at Diagon Alley, the Highly Anticipated Expansion of The Wizarding World of Harry Potter at Universal Orlando Resort". Huffington Post. Retrieved February 27, 2018. ^ Goldman, Eric (July 8, 2014). "The Wizarding World of Harry Potter - Diagon Alley Officially Opens". IGN. Retrieved February 27, 2018. ^ Powers, Scott (February 8, 2006). "Theme-park pioneer started SeaWorld and Wet 'n Wild". Orlando Sentinel. Retrieved September 28, 2012. ^ "Seventh Universal Orlando hotel slated to replace former Wet 'n' Wild water park | Inside the Magic". Inside the Magic. March 21, 2017. Retrieved February 27, 2018. ^ a b "Universal reveals details for 2,800-room hotel complex on former Wet 'n Wild land". www.bizjournals.com. Retrieved February 27, 2018. ^ Dagon, Russ (April 5, 2018). "NAME REVEAL: Universal's Endless Summer Resort". Close Up. Universal Orlando Resort. ^ "Summer Concert Series". Universal Orlando Resort. Retrieved August 13, 2010. ^ Universal Orlando Resort. "Gradbash at Universal Orlando Florida". Universal Orlando Resort. Retrieved September 25, 2012. ^ "Gradventure". Universal Orlando Resort. Retrieved September 25, 2012. ^ "Holidays". Universal Orlando Resort. Retrieved August 13, 2010. ^ "Mardi Gras". Universal Orlando Resort. Retrieved August 13, 2010. ^ "2019 HARRY POTTER CELEBRATION CANCELLED AS WIZARDING WORLD WORKS ON NEW ATTRACTIONS". SyFy. Retrieved November 6, 2018. ^ "A Celebration of Harry Potter". Universal Orlando Resort. Retrieved January 31, 2016. ^ "A CELEBRATION OF HARRY POTTER 2017 – COMPLETE INSIDER'S GUIDE". 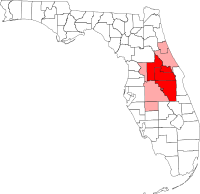 Orlando Informer. Retrieved March 5, 2017. ^ "NATALIA TENA ANNOUNCED AS FINAL HARRY POTTER FILM STAR JOINING A CELEBRATION OF HARRY POTTER". Universal Orlando Blog. Retrieved February 1, 2018. ^ "News Releases". Universal Orlando Resort Media Site. Archived from the original on July 17, 2011. Retrieved July 7, 2008. ^ HHN Vault.com. "Halloween Horror Nights Haunted House Locations". HHN Vault.com. Archived from the original on October 12, 2007. ^ a b "Blue Man Group at Universal Orlando: FAQs". Archived from the original on November 12, 2006. Retrieved July 7, 2008. ^ "Orlando Events, Central Florida Events, Festivals, Concerts, Movies, Arts, Entertainment". WFTV.com. Archived from the original on May 10, 2008. Retrieved July 7, 2008. ^ "Aquos Theater". Central Florida News 13. Archived from the original on October 15, 2007. Retrieved July 7, 2008. ^ "Florida Attraction Tickets: Blue Man Group at Universal". Archived from the original on November 12, 2006. Retrieved July 7, 2008. ^ Pedicini, Sandra. "New Universal Orlando airport shuttle service is starting". OrlandoSentinel.com. Retrieved January 26, 2016. ^ "Orlando Shuttle Bus Service | ESCOT Bus Lines". ESCOT Bus Lines. Retrieved April 17, 2018. Wikivoyage has a travel guide for Universal Orlando. Wikimedia Commons has media related to Universal Orlando. This page was last edited on 14 March 2019, at 01:36 (UTC).